Global non-destructive testing equipment market was valued at USD 3.21 billion in 2014, growing at a CAGR of 5.8% from 2015 to 2021. Non-destructive testing equipment are used to evaluate or inspect the materials, assemblies or components for discontinuities in characteristics without tearing down the serviceability of the part or system. These tests are often used to determine the physical properties of materials such as ductility, ultimate tensile strength, impact resistance, fatigue strength and fracture toughness. The non-destructive testing is used to ensure product reliability and integrity to control manufacturing processes. In addition, non-destructive testing equipment also lower the cost of production and sustains a uniform quality level. Stringent government safety regulations for quality control, ensure safety and reliable performance of the machines, and increasing demand to improve quality and longevity of the machines are the major factors responsible for growth of global non-destructive testing equipment market globally. The global non-destructive testing equipment market is segmented by region into North America, Europe, Asia-Pacific (APAC) and Rest of the World (RoW). North America led the global non-destructive testing equipment market in 2014 and is also expected to maintain its dominance in 2021 as well in this market. The growth in North America is primarily attributed due to huge investments in energy verticals such as oil and gas. 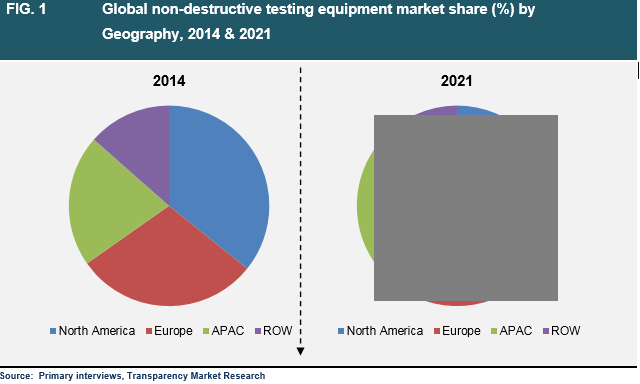 Europe held the second largest share of the global non-destructive testing equipment market in 2014 followed by Asia Pacific and RoW respectively. Asia Pacific is expected to be the fastest growing regional market for non-destructive testing equipment. The global non-destructive testing equipment market is segmented on the basis of technology into ultrasonic testing, radiography testing, electromagnetic testing, visual testing and others (including magnetic particle testing and liquid penetrant testing). Ultrasonic testing is holding the maximum market revenue share in 2014. The wide usage of ultrasonic testing in several industries such as steel and aluminum construction, manufacturing, aerospace and defense and automotive sectors are spurring the demand for this segment. The global non-destructive testing equipment market is further segmented by end use industry into power generation industry, oil & gas industry, aerospace and defense industry, automotive industry and others (including plastic and polymer, and medical). The global non-destructive testing equipment market is majorly dominated by power generation industry due to increasing number of nuclear power plants and the subsequent increasing demand for machines used in power plants. Automotive is expected to be the fastest growing end use industry in non-destructive testing equipment market followed by oil and gas industry.